The overall goal of this paper is to continue our efforts to forge new ground in identifying the effects of interdependencies in large complex networked applications and, if needed, uncovering early indicators of interdependency risk so that appropriate risk mitigation actions may be taken. Specifically, we seek to study and quantify the impact of network characteristics on cascading risk. 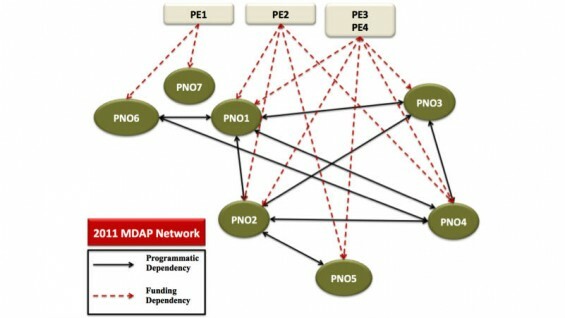 Cascading risk is defined as the propagation of programmatic issues across networked programs due to the interdependency of one program upon the other. Harnessing the extensive data that has been collected over the years in the form of Defense Acquisition Execution Summary (DAES) and Selected Acquisition Reports (SARs) documents for Major Defense Acquisition Programs (MDAPS), we will present our intermediate results in our ongoing efforts on leveraging network structure and sequential data to study cascading risks. We will also identify the challenges to data acquisition.